Phyre is shocked when she meets her student drama teacher Mia and experiences an attraction to the other woman that she can’t define. She’s never liked girls in a romantic wass before, but there is just something about Mia that Phyre finds irresistible. As Phyre gets more and more involved in drama, her best friend is with her at every step. Referred to only as “you,” it soon becomes apparent that “you” would also like to be more than just friends with Phyre. But who will Phyre choose, and is “you” a guy…or a girl? 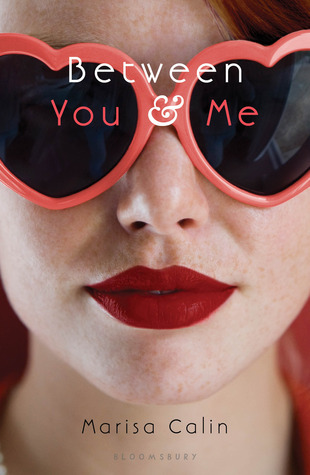 Told in an unusual hybrid of prose and drama, Between You and Me is a unique and absorbing read. Calin really gets the reader inside of Phyre’s head throughout the story, but as a result, everything going on outside of Phyre’s mind is limited to her narrow perspective, which is an interesting contrast. Phyre is a complex character—a little self-involved, silly, and very dramatic, but she’s also very passionate and a bit confused about her own identity, which makes her sympathetic. Meeting Mia forces Phyre to work through her feelings, both about her own identity and for her best friend, “you.” She really comes out of her shell and learns a lot about relationships and herself, but the novel’s draw will be the heightened tension as readers wonder if she’ll ever act upon her feelings for Mia, and then the mystery behind the most basic facts about the identity of “you.” Between You and Me is an inventive, enthralling, and quick book. Cover Comments: I like the red lips--they really stand out! And the sunglasses are significant in the book, so it's fun that they made their way to the cover! Very nice! I really like the cover too especially since the sunglasses are related to the story itself. While not my fave, it was a fun contemporary and very well-written.